In reality, the green is much more green than the yellowish color on my monitor. I chose it because I love clear light greens on the yellow side of the range but can’t wear them. They make me look ill (it’s the yellow in them). So I use the color as an accent around the house. One day, I would like to be able to quilt these fancy patterns but that day is still far in the future. It’s a very cheerful quilt, and I think not bad for a first-timer. It makes me happy to look at it. I am afraid the quilting bug is real. I stayed up past midnight cutting fabric for the next one – this one will be a sampler and the blocks require an awful lot of small pieces. I think I already have a preference for quilts that only require cutting strips and large squares, like my first one above. Yes, I’m a lazy fabric cutter. Thank you, ladies, for your warm comments on my previous posts. BetsyV: the chair is very comfortable – it’s just like sitting on a regular exercise ball but it won’t roll away from you and it has a back rest so you don’t fall off when you lean back. I got it at the Office Depot or Office Max some 7 or 8 years ago. You can get one like mine or one of the new interesting-looking models. I love the modern look to it, and the colors. The wide white border is great for use on your bed. It really highlights the patchwork in the center and focuses the eye. Very nice! So pretty! I love the pattern. 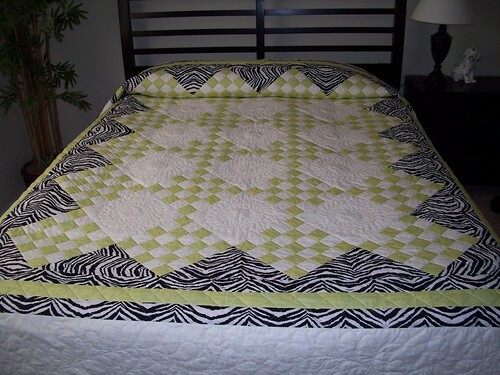 :-)I’m a big fan of strip-pieced quilts too, though. SO much faster to assemble. That quilt is so beautiful! Traditional at first glance, but then.. apple green and zebra stripes?! Very stylish.Almost you convince me to quilt..
That is a truly beautiful first quilt. Good job!!! That is gorgeous!!! It’s hard to believe it’s your first quilt. Your fabric choice is fantastic and it looks really nice with your furniture. Your quilt is just lovely. You did a great job on the piecing! Your first quilt is beautiful. Of course, like everthing you make, it is perfect. And your longarmer also did a wonderful job. I read back and see you are in Wyoming. You really are seeing diverse parts of this country. What a beautiful bed! It looks like a catalog photo. It’s hard to believe that is your first quilt.